So have you guys been getting your (SHIN) anime doses? Post subject: So have you guys been getting your (SHIN) anime doses? Thought I'd bring back this topic from CI, and talk about some anime/manga with you lot. In terms of Anime, I just finished Tiger and Bunny today. It's basically a DC tier Superhero show but it was surprisingly good and quite meta. Show revolves around 8 or so heroes who have special powers basically being heroes for a TV show called Hero TV. They compete with each other to catch bad guys and such, but the show would rather they get better ratings and advertising than actually doing their jobs half the time, which is a nice touch and lets the blatant advertising have SOME purpose in this anime. Much like Little Witch Academia, the first 12 episodes focuses on the main character and his endeavors ending with a two episode standoff with the bad guy, and the next 12 episodes focus on other characters as well as the overarching story coming into place. It went from a 6/10 anime to a 8/10 anime from me just for the final 6-7 episodes alone where it really got good. I'd recommend it if you enjoy super powers as well as actual English in your anime, although it's very good regardless has a nice plot, interesting stories and is quite funny sometimes. Dub is good too. I've also been watching several things at once. Made in Abyss and Mob Psycho 100 are two I'm forced to watch at the anime soc at uni every week. I like MiA, but find MP100 to be boring. Both are on episode 7 right now, and while one is getting better the other is just boring, here's hoping it improves like One Punch Man did. I also started Monster a while back, that's a really good show I gave it a 9/10 after around 5 episodes just because I loved the plot and it's very well done. I'd suggest that to anyone if they haven't watched it yet, I'm only on episode 21 and feels like a real TV drama. Manga wise, I've been reading a variety of stuff but for now I've been focusing on Slam Dunk, I'm around 130 chapters in, and yeah it's good and all but Basketball isn't really my thing so it can be boring a lot of the time, it's still very good though. How about you guys, what are you watching/reading these days? Post subject: Re: So have you guys been getting your (SHIN) anime doses? Recently, I've been rewatching episodes of ATLA at a one episode per-week basis, but we all know it's hotly debated whether or not that show counts as an anime. My relatively recent watches have been Made in Abyss and Devilman Crybaby, both of which I enjoyed the heck out of. I've been watching dragonball super and plan to start on the fate series soon. Mostly just watching Inuyasha nowadays. I'm watching My Hero Academia Season 3, Dragon Ball Super, Jojo's Bizarre Adventure (re-watching Stardust Crusaders), and Gundam Iron Blooded Orphans has my attention too. I don't tend to watch much of anything even though I have a list of anime that I want to watch. I can say I saw about half of Monster, though (I ended up stopping in the 40s and I forget why. This happens all of the time). I really want to get back into Monster one day, and watch it from start to finish. I don't like being "that guy" anymore, but you have read the unanimated parts of Jojo? If you're rewatching Part 3 you might be strapped for what to do next, and while I personally don't like 5 or 6 that much, I'd still say you should give them a read. They even have coloured scans. Speaking of Jojo, have this. Yeah, Monster is really good. I knew about it for years but the 74 episodes really put me off. I'm terrible when it comes to watching stuff (literally can't sit still and pay attention for 20 mins) which is why I never watched anime much when I was a teenager, but this year I watched Yawara (another anime by the guy who made Monster) and that was 124 episodes long as not as good as Monster so I've been getting through Monster bit by bit, currently on episode 25 and that took me around a month, so at this rate I'll be through it soon enough. It started out really well and has been a great ride throughout, very emotional and mature for an anime. You could adapt it into an actual live action TV drama and it'd do very well. I gave it a 9/10 pretty quickly as well, since I usually give stuff I enjoy an 8, so a quick 9/10 means it's very good. I find myself really second guessing characters and their motives. With Tenma's ex-fiancée probably being the most confusing. I hated her at first, and then as time went on she constantly changed in my mind, one minute I was sorry for her situation and the next I was angry at how childish she was acting. Sorry for the late reply, but here. 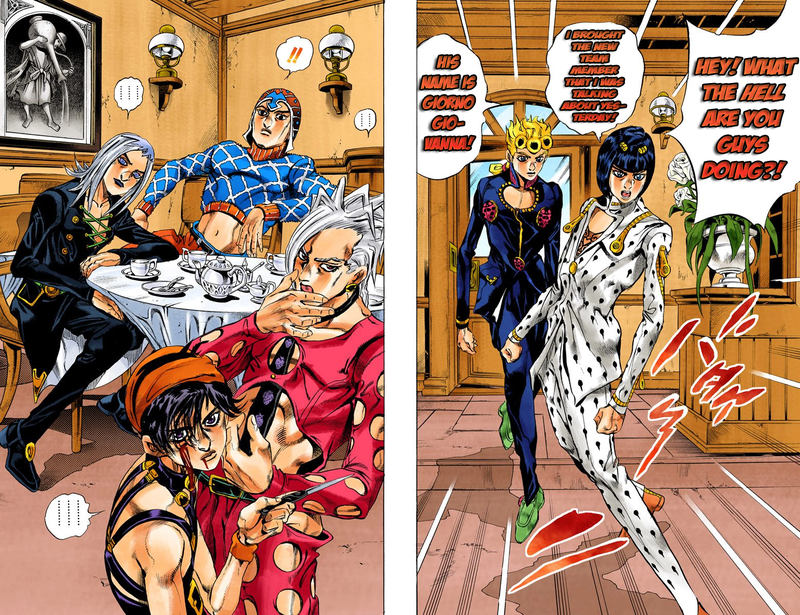 Before I noticed there was an option for coloured scans, I read 1-5 in B/W and then Part 6 and 7 coloured. They're really cool ways of reading it and some even come with the music the stands introduced in the volume are based off. They're pretty good as well.